Located on Grand Army Parade and with it’s gold, marble and crystal opulence of a palace, it is New York’s Premier Hotel. This is a non-refundable booking. Applies to Edwardian Suite category and above. Enjoy the suite experience at The Plaza. For our suite guests, The Plaza is pleased to offer Butler service 24 hours a day. Old world luxury and elegance are complemented by discreet placement of the latest technology thoughtfully integrated throughout each room bringing guests high-definition television and wireless high-speed internet access. The Plaza is the first hotel in the world to offer in-room iPads for all guests to control their entire hotel experience. At the touch of a screen, guests can order In-Room Dining, make restaurant reservations, communicate directly with the Concierge, request wake-up calls, and even check airline schedules and print boarding passes. 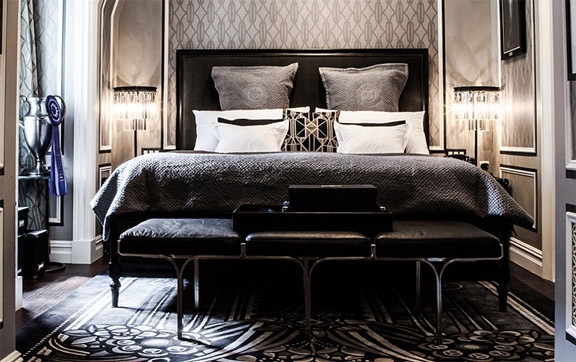 Timelessly elegant and extremely spacious, all Guest Rooms include a sitting area, sumptuous bedding with the finest fabrics, and an oversize bathroom with moisaic floors and 24-carat gold plated Sherle Wagner fixtures. The Plaza Room features one King bed and is located on floors 5 – 19. Bathroom is finished with inlaid “earth stone” mosaics and include a luxurious bathtub and separate shower. Among many splendid details are 24-carat gold-plated Sherle Wagner fixtures, as well as hand-crafted solid white marble vanities. The Plaza’s expansive Deluxe King Room has one King bed and provide 550 sq. ft. of living space. Bathroom is finished with inlaid “earth stone” mosaics and include a luxurious bathtub and separate shower. Among many splendid details are 24-carat gold-plated Sherle Wagner fixtures, as well as hand-crafted solid white marble vanities. For those seeking more spacious accommodations, Deluxe Double Queen Rooms deliver 550 sq. ft. of living space with double Queen beds, two comfortable armchairs, and a meticulously crafted writing desk. Bathroom is finished with inlaid “earth stone” mosaics and include a luxurious shower and separate WC. Among many splendid details include 24-carat gold-plated Sherle Wagner fixtures, as well as solid white marble vanities. Signature Terrace Room features a private terrace, a King bed, and a deluxe bathroom. Bathroom is finished with inlaid “earth stone” mosaics and include a luxurious bathtub and separate shower. Among many splendid details are 24-carat gold-plated Sherle Wagner fixtures, as well as hand-crafted solid white marble vanities. These expansive suites offer striking beauty, luxury and elegance in both traditional and open-concept layouts and are appointed with all the splendid touches for which The Plaza is famous. The Junior Suite features an open-concept room that provides a comfortable sitting area, King Bed, and Butler’s pantry. The bathroom reflects The Plaza’s classically elegant style with inlaid “earth stone” mosaics, a luxurious bathtub, and a separate, oversize shower. Details include 24-carat gold-plated Sherle Wagner fixtures, as well as solid white marble vanities and wet bar. Junior Suite – Double Queen features an open-concept room that provides a comfortable sitting area, two Queen beds, and Butler’s pantry. The bathrooms reflect The Plaza’s classically elegant style with inlaid “earth stone” mosaics, a luxurious bathtub, and a separate, oversize shower. Details include 24-carat gold-plated Sherle Wagner fixtures, as well as solid white marble vanities and wet bar. The Edwardian Suite is located on floors 11 to 19, and are nearly double the size of the standard Plaza guest room. The bedroom and master bath are separated from the spacious living room by elegant sliding doors that close for privacy. The Two Bedroom Edwardian Suite features a King bed in each room, a Butler’s pantry, and a separate powder room for guests. They offer an expansive 1,550 sq. ft. of living space and are located on floors 11 to 19. Edwardian Suite bathrooms are appointed with the finest luxury materials, including inlaid “earth stone” mosaics and 24-carat gold-plated Sherle Wagner fixtures in addition to a luxurious bathtub and separate shower. The Rose One Bedroom Suite features up to 700 sq. ft. of living space with a partition between the king bed and sitting room for privacy. The bathroom is finished with inlaid “earth stone” mosaics and include a luxurious bathtub and separate shower. Among many splendid details are 24-carat gold-plated Sherle Wagner fixtures, as well as hand-crafted solid white marble vanities and wet bar. Recently unveiled The Legacy Suites deliver luxurious, contemporary residential style with heritage touches and traditional appointment. Each features sumptuous materials, sophisticated decor, commissioned art and furniture a well as other luxurious touches. The Carnegie Park Suites offer unparalleled luxury and spectacular views of central park. Carnegie Suites are located on floors 11 – 19 and come with a King bed, a spacious living room, and a powder room for guests. Legacy Suites are complemented by the most attentive and discreet white glove butler service. The two bedroom, two bathroom Ellington Park Suite comes with a King bed in each room. Enjoy breath-taking Central Park views from the large and beautifully designed living room. 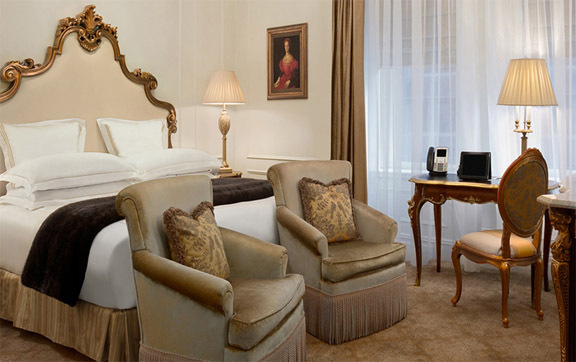 This elegant suite offers a contemporary décor that pays homage to the rich history and heritage of The Plaza. Legacy Suites are complemented by the most attentive and discreet white glove butler service. The timeless Pulitzer Fifth Avenue Suite overlooks Fifth Avenue and the Pulitzer fountain and come with a King bed and up to 1,000 sq. ft. of living space. The elegant suites offer a contemporary décor while paying homage to the rich history and heritage of The Plaza. Legacy Suites are complemented by the most attentive and discreet white glove butler service. The magnificent three-bedroom Metropolitan Fifth Avenue Suite features a dining area, two private parlors, and white-glove Butler Service. The two bedrooms have King beds plus two full size sofa beds. All bedrooms have their own beautifully designed en-suite bathroom. The Metropolitan Suite includes contemporary works of art, as well as a great view of Grand Army Plaza and the Pulitzer fountain. The Penthouse Suite offers 1,500 sq. ft. of living space on two levels. The upper level features a large bedroom with a King bed as well as a beautifully furnished terrace. The lower level of this meticulously designed suite features a spacious living room as well as a study/guest room. The two-bedroom Vanderbilt Fifth Avenue Suite offers unparalleled luxury. The master bedroom comes with a King bed and the second bedroom with a Queen. The Vanderbilt suites also include a separate living room and dining area in 1,500 sq. ft. of living space. All Legacy Suites are complemented by the most attentive and discreet white glove butler service. The Plaza’s legendary One of a Kind Suites delivers unrivalled splendour, grandeur and comfort and are completely unique in design. Each has been meticulously fashioned around a theme inspired by the iconic history of The Plaza. 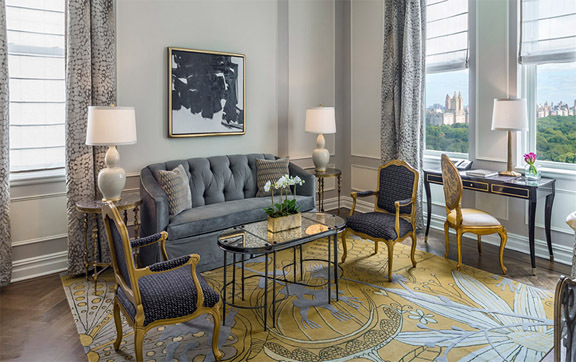 The palatial Royal Suite is a lavishly appointed, three-bedroom suite with private elevator access, overlooking Fifth Avenue and the legendary Pulitzer Fountain. 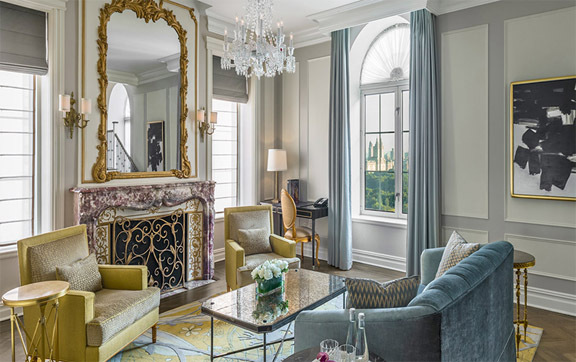 A favorite of heads of state, large families, and those seeking to entertain in grand style, The Royal Suite offers the most extraordinary experience at The Plaza. This elegant suite perfectly evokes the era of author F. Scott Fitzgerald, one of The Plaza’s most illustrious patrons. The lavish one bedroom suite has a separate intimate living room and curated art throughout the space. The Fitzgerald Suite is complemented by the most attentive and discreet white glove butler service. This dramatic, one-of-a-kind room is located on the 18th floor of one of the corner turrets of The Plaza. It features a round master bedroom overlooking Fifth Avenue. under a soaring, 23-foot exposed brick turret ceiling. The Tower Three Bedroom Suite consists of three connected rooms: The Tower Room, The Pulitzer 5th Ave Suite, and a Deluxe King Room. Look for the pink door down the corridor and step into Eloise’s very own room at The Plaza. Here, everything is pink and white. Just the way Eloise likes it! Her clothes are in the closet. Her favourite books, toys, and dolls are on the shelves. Her bed has a sparkly pink headboard and there’s a zebra carpet on the floor. Above the bed is a huge neon sign that says “Eloise”! There’s even pink all over the bathroom! For over a century one hotel has stood the test of time in New York City and remains an iconic cultural oasis amid a bustling metropolis. The Plaza continues the tradition of defining luxury through unmatched service reminiscent of the golden era of hotels with a modern spirit. The Plaza Hotel offers 282 distinctive guestrooms, including 102 suites, which boast the largest square footage of any luxury hotel in New York City. From the sumptuous décor to the impeccable white glove service, The Plaza is an extraordinary Midtown Manhattan hotel that offers every indulgence. Imperiously situated on Grand Army Plaza at the south east corner of Central Park and Fifth Avenue, this is prime Manhattan real estate. You not only have the park as your playground but you’re a walk away from all the Midtown action as well as Museum Mile and Madison Avenue boutiques. The Apple Store, FAO Schwarz and the Wollman Ice Rink are literally outside the front door. There are so many culinary outlets within that it’s hard to know where to choose. The famous Palm Court with its tropical topiary is overseen by the hotel’s new culinary director, restaurateur Geoffrey Zakarian, and looks set to reclaim its glory years. It’s rightly famous for afternoon tea, but come for evening for cocktails and people watching. New offerings include the elegant Champagne Bar and the swanky Rose Club. The acclaimed Todd English Food Hall and the Plaza Food Hall are vast specialty food emporiums selling everything from caviar to artisanal chocolate. You won’t go hungry. The Caudalie Vinothérapie® Spa is the perfect oasis in which to relax and restore skin, body and mind. The spa artfully melds our signature elements – warm precious wood, relaxing dark stones and symbolic vine sculptures – to create an inviting modern ambiance. Fourteen treatment rooms, a Vichy shower, a private VIP room for two, Vinothérapie® Spa signature barrel bath, two Hammams and an exclusive French Paradox Wine Lounge create a unique environment for Caudalie’s world renowned skin care rituals. La Palestra is a state-of-the-art fitness center located on the lower level of The Plaza Hotel. Founded in 1994, La Palestra has pioneered a unique and integrated methodology for medical diagnosis, treatment and health maintenance programming. In addition to their world-class personal training and fitness classes, there are also trained medical professionals who provide preventative treatment and medical analysis. The Warren-Tricomi Salon, a 6,100 square foot space at The Plaza, is the ultimate testament to the duo’s unparalleled position in the industry. Renowned for both superior pampering and subtle sophistication, Warren-Tricomi and The Plaza together represent the perfect marriage of luxury and style.